Enticingly comfortable Anna Kern dancing shoe with T-strap and four part front, that offers a perfect fit thanks to its flexibility. 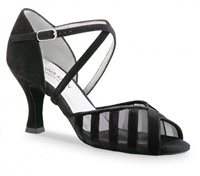 The individually adjustable heel clasp offers an optimum and comfortable fit. Fantastically comfortable and flexible Anna Kern dancing shoe. The small open toe as well as the enticing V-cut in connection with the individually adjustable crossed instep and heel straps offer a perfect and extremely comfortable fit.